The Low Ropes Challenge course is an opportunity to learn about teamwork, about communicating, and about pulling together to solve 'challenge activities'. It's also a great opportunity to discover how you interact with others in a team. And a Low Ropes session is also a great way to develop a team. So, within 3 hours of arriving on our 4-day NLP Core Skills the group is exploring the Low Ropes. It's a great way to learn to function team - because the group is learning about teamwork from the inside! And, since pulling together as a team work is fundamental to how we learn at Pegasus NLP, it's gets things off to an excellent start for our learning journey. 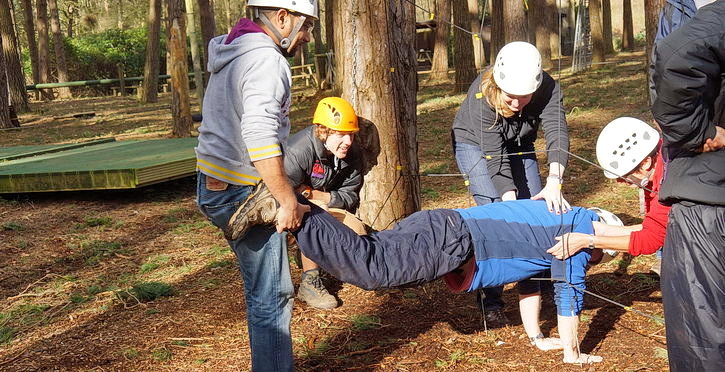 Our Low Ropes Challenge session is a hands-on experience of what it is like to quickly get to know people and function as a self-directing team - whilst solving a range of ‘challenges’ each of which has been cunningly designed to require a group to pull together in order to solve them. And we don't begin with a lecture on what supports or impedes good teamwork. You have to discover this for yourself - through working with the others in your team to figure out the solution to the various challenges. But the end of the 90-minute session isn't the end of the learning. Back at the Lodge and over a cuppa you will be using NLP methods to review your experiences and identify practical learning points from the activity. operates in a cohesive manner. It's an opportunity to recognise in action the validity of a key Pegasus NLP principle: None of us is as smart as all of us! And, incidentally, it is called a ‘Low’ Ropes course because you are never more than about 60 cm above the ground. Learning in this hands-on manner produces many more of those wonderful "Ah Ha!" moments of personal discovery which make it more likely that you continue to use what you've learned/discovered for years after the course is over.